One of the biggest responsibilities of owning a swimming pool would be that of pool maintenance. After all, what good is a swimming pool if it’s not kept crystal clean and running smoothly? Keep in mind that a large part the maintenance process also means pool cleaning; remember that keeping a pool clean helps to ensure that harmful bacteria and debris does not have the chance to cause damage and disrepair to your swimming pool. Winter may give pool owners a bit of relief when it comes to swimming pool maintenance, but that doesn’t mean that pool cleaning should be completely forgotten. Fortunately there are a few quick things that every pool owner can do to help cut down on the amount of time they spend maintaining their pool now before spring. The first step is to clean out any leaves, insects, dirt and debris. Use your pool vacuum, or just fish them out with a net. Clean out the skimmer and the pump basket, too. Clean the tile line with tile cleaner. Easier now than next spring, when the scum has had all winter to set. This protects the pool from corrosion or scale buildup. Using a water test kit, adjust the water to the recommended levels of pH, total alkalinity, calcium (hardness) and chlorination. If you want to add a winterization chemical kit, do it now. These kits put high levels of chlorine and algaecide in the water to prepare it for the winter months ahead. Your pool retailer offers ready-made kits for the purpose; use according to the maker’s directions. In the case of larger pools, you may be directed to supplement the kit with additional quantities of some chemicals, too. Don’t add tablets or a floater that contains chlorine or bromine—they can damage the equipment nearest them. If you already have chlorine or bromine tablets in your feeder, let them run out so that none remain. If you’re adding winterizing chemicals, pour them into a bucket and then into the pool. Some of these chemicals instruct you to turn on the pool filter while you add the chemicals. Make sure you do, especially if you have a vinyl liner pool—you don’t want stains on your liner from un-dissolved granules or damage to your equipment from concentrations of chemicals in the water. During the day the temperatures are not as cold as most of the country, but at night it does get extremely cold in the desert. Continue to check your pipes and motorized parts for any water, and drain water from the heater, pump and filter if any is found. Frozen water can cause these components to crack and need replacing. 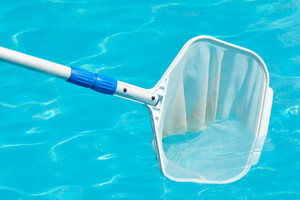 Contrary to popular belief, draining your pool is not part of winter pool cleaning, nor is it even good for your pool. When you drain our pool you can cause all sorts of problems such as your pool surface cracking and the pool foundation floating do to surface water. Dropping your water levels up to 6 inches below the pool skimmer is fine, but keep your pool regularly filled to that point. As important as pool care is during the summer, it’s even more important to make sure that you properly secure it for winter. After all, no one wants to remove a pool cover at the start of summer only to find out that their pool has a leak or that their water is full of dangerous bacteria. Taking the right steps to properly winterize your pool can save you lots of time and money on repairs for next season.